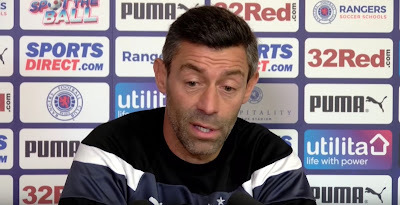 Ibrox Noise: Pedro: "They can say what they like, I don't care"
Pedro: "They can say what they like, I don't care"
In a contrast, apparently, to past Rangers managers, Pedro Caixinha has confirmed he simply does not care what the press and websites say about him and is here to do his job. When asked if he felt this week was a defining week in his stewardship of the Marble Staircase in light of media criticism, Caixinha clarified that he was not interested in the opinions of anyone in the press or similar, and was here as Rangers manager focused on his job and his job alone. Quite honestly we have no issue with this. As any person in the spotlight will tell you, the worst thing to do is read about yourself in the newspaper or online. Rarely is it flattering and the British press are notorious for smearing anyone they can. We cannot dispute Pedro’s approach to this and we applaud him for ignoring what people say. “I can tell you something. Steve, when I first came, here, on the reception, came to me with a huge amount of newspapers on the first day and I asked him ‘why this?’. [Steve replied] ‘All the managers ask [for] this’. [Pedro responded] ‘I came here to work, I didn’t come here to read newspapers’. I don’t watch TV so I don’t care about it. I’m here to do my job and I’m focused on my job and my job is about winning. If I don’t win, I will be judged by that. Ok, it’s part of the job as well but I’m not thinking about it". Again, this is the kind of attitude that is correct. What the press, sites (like ours) say should not concern the guys who actually doing the job. We are allowed our opinions and to discuss them and they are allowed to not care and just get on with what they are paid to do. And hopefully they get on with winning tonight and putting our club in the semi finals of the League Cup.